After installing the DP Platform, install the DLM Service App. All service applications are installed as RPMs on the same host as DP Platform. You can install one DP app or a combination of DP apps with DP Platform. You must have root access to the host on which you are installing DLM. You must have successfully installed DP Platform. Log in as root to the host on which you set up the DP repositories. Verify that all DataPlane containers are running as expected. Install the RPMs for the DLM service application. If the yum command fails, then the local repository was not set up correctly. Check the repository file /etc/yum.repos.d/dlm.repo on the host. Navigate to the directory containing the installation scripts for the DLM service. 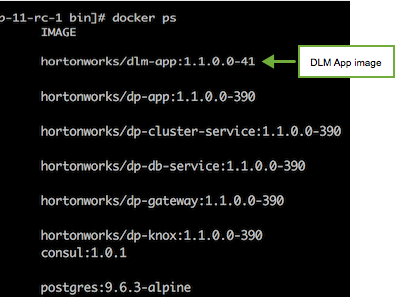 Load the DLM Docker images and initialize the environment. Loading the images might take a while. When prompted to enter the previously entered master password for DataPlane apps, specify the same password that you have created while installing DP to protect the secret storage. The DLM app requires this to store cloud credentials to the secret storage. Verify that the container you installed is running. If any containers are not running, you must destroy the containers and start over, as described in the troubleshooting section of the DP Installation guide.